Shallow water acoustic network s are generally formed by acoustically connected ocean bottom sensor nodes, autonomous underwater vehicles (AUVs), and surface stations that serve as gateways and provide radio communication link s to on -shore stations. The QoS of such network s is limited by the low bandwidth of acoustic transmission channels, high latency resulting from the slow propagation of sound, and elevated noise levels in some environments. The long -term goal in the design of underwater acoustic network s is to provide for a self- configuring network of distributed nodes with network link s that automatically adapt to the environment through selection of the optimum system parameters. Here considers several aspects in the design of shallow water acoustic network s that maximize throughput and reliability while minimizing power consumption And In the last two decades, underwater acoustic communications has experienced significant progress. The traditional approach for ocean -bottom or ocean-column monitoring is to deploy oceanographic sensors, record the data, and recover the instruments. But this approach failed in real -time monitoring. The ideal solution for real -time monitoring of selected ocean areas for long periods of time is to connect various instruments through wireless link s within a network structure. And the Basic underwater acoustic network s are formed by establishing bidirectional acoustic communication between nodes such as autonomous underwater vehicles (AUVs) and fixed sensors. The network is then connected to a surface station, which can further be connected to terrestrial networks such as the Internet. 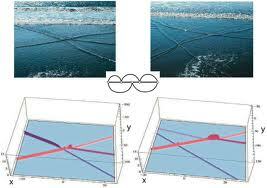 Under water sensor network, acoustic network, acoustic communication architectures.